The PubMed shirt (available here) only needs ONE more order to go to print. If you know anyone in meatspace that would love this shirt (like the people who use PubMed all the time) let them know so they can order one. The campaign will stay open until the end date so it is possible that people can order more than the goal. The On Tuesdays We Llama shirt is also one away from the goal. Perfect gift for someone who just likes Llamas. Total US cost was 18.85 for the tshirt so absolutely perfect under $20 gift. The No One Cares About shirts designed by the wonderful Genghiskant needs 4 order before going to print. Total US price is 23.85. Both This is what a misandrist looks like campaigns are 4 away from being sent to the press. Perfect for your favorite man hater(Also perfect since it is not a GT in joke so no explaining your efriends to your meatspace friends.) Total US price (includes shipping was 23.85 for the t-shirt. The original Goon Squad campaign that is ending in 5 days needs 2 orders for it to be printed. Total US price is $19.85(includes shipping). TW: Misandry is 2 orders from the original goal. Total US price is $20.85. 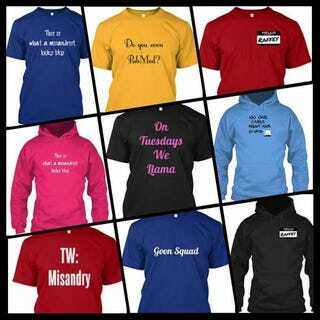 The Misandry at it's finest store has all the shirts in one location.